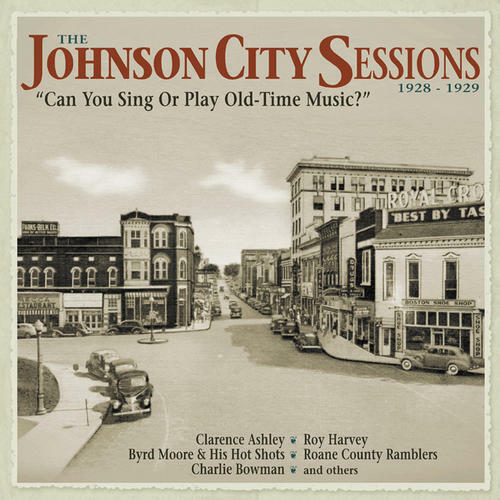 Cityhall:The Johnson City Sessions 1928-1929 - "can You Sing Or Play Old-time Music?" The Johnson City Sessions 1928-1929 - "can You Sing Or Play Old-time Music?" Title: The Johnson City Sessions 1928-1929 - "can You Sing Or Play Old-time Music?" (4-CD + 136 page hardcover book) The famous 1927 Bristol Sessions, produced by Victor Records in Bristol, Tennessee are known as 'The Big Bang Of Country Music.' But don't overlook the recordings made in nearby Johnson City by Columbia Records in October 1928 and October 1929. Collectively, the Johnson City recordings are regarded by scholars, collectors, and lovers of old-time music as a distinctive cross-section of Appalachian music, captured on the cusp of the Great Depression. Indeed, the final recordings of the 1929 session took place on October 24 - the infamous 'Black Thursday' when Wall Street crashed. Bear Family Records has gathered the entire issued output of the 1928–29 Johnson City sessions. This is the first time all 100 songs have been issued together...and the first time many have been heard since the Depression. The accompanying 136-page, LP-size hardcover book contains newly researched essays on the background to the sessions and the artists, with many rare and unpublished photographs. Also included are complete song lyrics and a detailed discography. Three of these performances were chosen by the pioneering scholar Harry Smith for his 1952 compilation 'Anthology Of American Folk Music' - a seminal source for the urban folk revival of the 1950s and '60s: The Coo-Coo Bird by Clarence (Tom) Ashley, Old Lady And The Devil by Bill and Belle Reed, and Down On Penny's Farm by The Bentley Boys - the inspiration for Bob Dylan's Hard Times In New York Town and Maggie's Farm. Other gems include a topical best-seller of the Prohibition era, When the Roses Bloom Again For The Bootlegger, the Grant Brothers' Tell It To Me, revived by the Old Crow Medicine Show, and many more. 'Can You Sing Or Play Old-Time Music?' is packed with stringband tunes, ancient ballads, sacred songs, hillbilly blues and blue yodels - the entrancing musical world of old Appalachia.